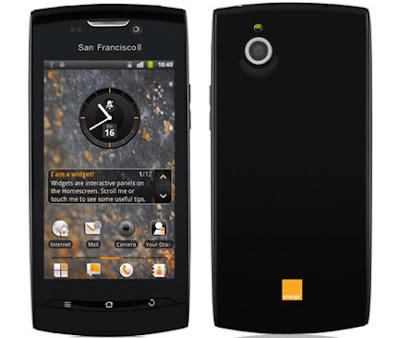 Orange San Francisco 2 provides the range of Smart phone that provides much cheaper comfort yet with the world class quality. It price range amount to £10.50 in UK on contract offers. The phone yet with Android 2.3 Gingerbread is a nice bargain on a cheaper rate. It has great functionality. Its 3.5 inch screen good for colour balance and even allows You Tube clips to be operated on it. Its processor is also equally smooth to carry out all the necessary and usual works. The phone is provided with a 5-megapixel camera in order to produce systematic and proper photographs. It is a great choice for a smart phone beginner. In design San Franscisco 2 is an improvement over the original San Francisco. In style it is somewhere is similar to Sony Ericsson. The curved top and bottom, as well as the three curved buttons below the screen, gives the feel of the Sony Ericsson Xperia Neo or the Xperia Arc. This budget phone gives rather better and nice feel. Its plastic casing provides flexibility. Its total weight is 120 gram and its length is 117mm and its width is 58mm wide. Thickness of the phone is 10mm. The phone correctly fits into even tight jean pocket. It accepts microSD cards with a s storage capacity of 512MB.it has many Android widgets. The Facebook widget brings the best of friend updates. With 800MHz processor and 512MB of RAM it gives fair performance under the banner of a Smart Phone.